This is my first post of a commissioned piece. 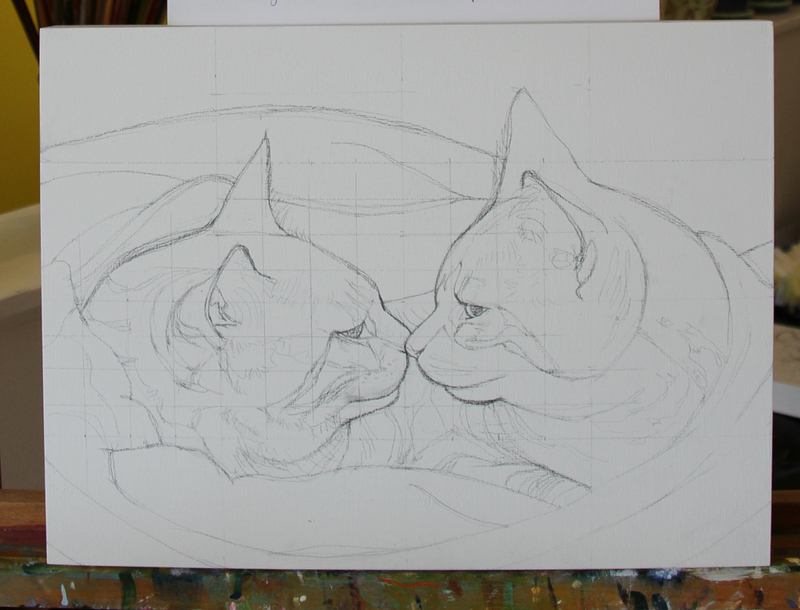 Since it’s not a surprise gift I can share with you my steps as I work to capture the loving spirits of these two adorable ginger cats! Both are brothers and one has sadly passed on thus making this commission very special for the client and extra important for me that I really capture both their likenesses and personalities. Step One: What is this painting for? A I mentioned above, this painting is a commission and it’s for a lovely lady I met at the Ancaster Cat Show. I am always pleased to meet my clients in person, which sometimes does not happen until the end of the commission. Meeting clients before hand is not necessary but it is always nice to meet the person you will temporarily be working for! Step Two: Find an image. Since this is a commissioned piece, my client provided me with an image that I should primarily work from. She also supplied me with additional reference images so that I could have more visuals since the colours were not true to life. 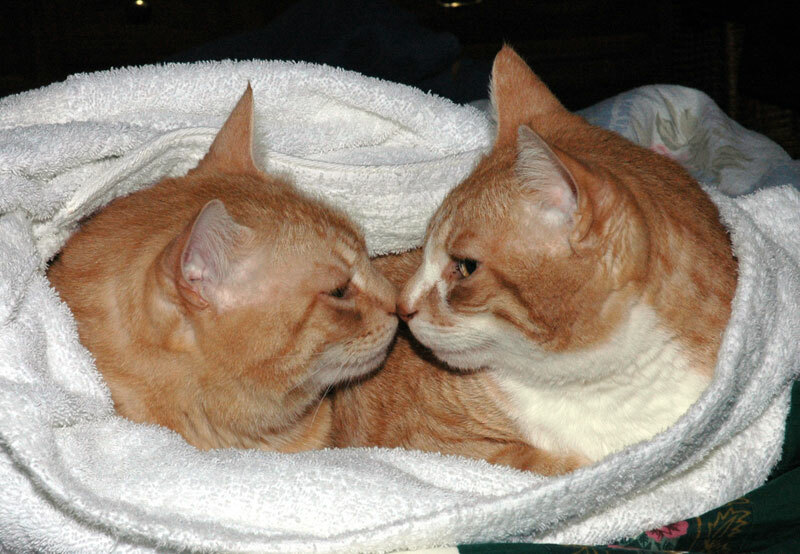 Cody in fact was more of a creamy ginger, which is not apparent in the photo below. In regards to reference images, I always encourage my clients to provide me with as many pictures that they feel comfortable sharing since this helps me tremendously at capturing the likeness for the portrait. Step Three: Crop and adjust the image in Photoshop. After receiving the preferred image I played around with a couple of crops before deciding on 12×16 as the final size. I also adjusted the levels by making the image have more contrast between light and dark and I also removed and cloned certain areas. Once I start painting I will adjust the colours and image accordingly. The painting never looks exactly like the reference image, as that’s only a starting point. After all, this is a painting and not a photograph. The painting will have qualities that are far more special than the photo will ever have. Step Four: Prep the painting surface. Since I decided to paint on panel I had to gesso the surface several times with light sandings in between. Nothing very exciting about this process but for some reason I really enjoy this step. Perhaps it’s the anticipation of starting the painting? Step Five: Print out the reference imagery and add grid lines. Sometimes, well most times, I prefer printing out the good quality reference image first so that I can have a look at it, and study it a while before I attempt to transfer the image onto canvas or panel. This painting was no exception. I printed out a high res, full colour print on double sided matte paper, of which I currently have taped to my easel. I then printed a black and white version onto a sheet of regular paper. It is to this print that I add the grid lines in marker which in turn I duplicate on the painting surface using a pencil instead. Step Six: Transfer image onto the painting surface. As mentioned above, I transferred the image by way of a grid method. I decided on this technique instead of the Organic transfer because I wanted the image to be exact, or at least as close as I could get at that moment. I don’t like fiddling around with the shapes and likenesses once I start painting. Those types of adjustments add extra time to the painting process because usually have to wait for the “need to fix” areas to dry before I can “fix” them. Having said that, I do ultimately adjust small areas once I start painting, that is inevitable but these usually are small and minor areas that just need a little tweaking, nothing too serious like adjusting head position or size. Step Seven. Colour Wash. Since the image for the most part has warm undertones (ie. 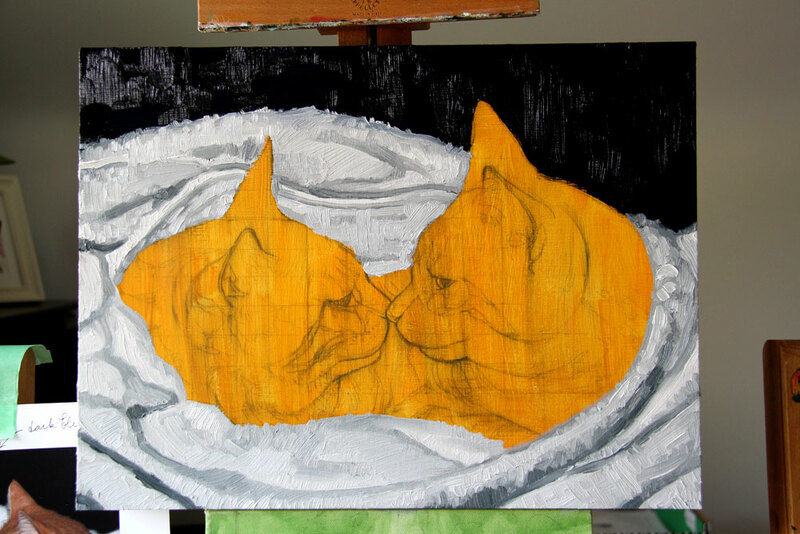 the fur), I decided to paint a light orange wash over the entire surface. I am not too concerned if areas of orange are visible after I lay down a brush stroke as I think it will compliment the over all colour palette of the painting. Step Eight. Paint. As mentioned above, if areas of orange are still visible I won’t be upset since I think it will help with tying in the entire colour palette. Primarily this painting will be shades of orange and grey with hits of white and complimentary hues of blue. As you can see I have only completed the background, which in the photo looks to be black but it’s actually a very dark shade of blue. Depending on how it dries over the next few days I may go back into it and add more vivid blues to make it more interesting but not too interesting since I don’t want the background to be more eye catching then the boys! I want the background to be the primary “blue” present in the painting with shadowed areas being the secondary. I’ve pretty much completed the cloth, which is a white terrycloth towel. 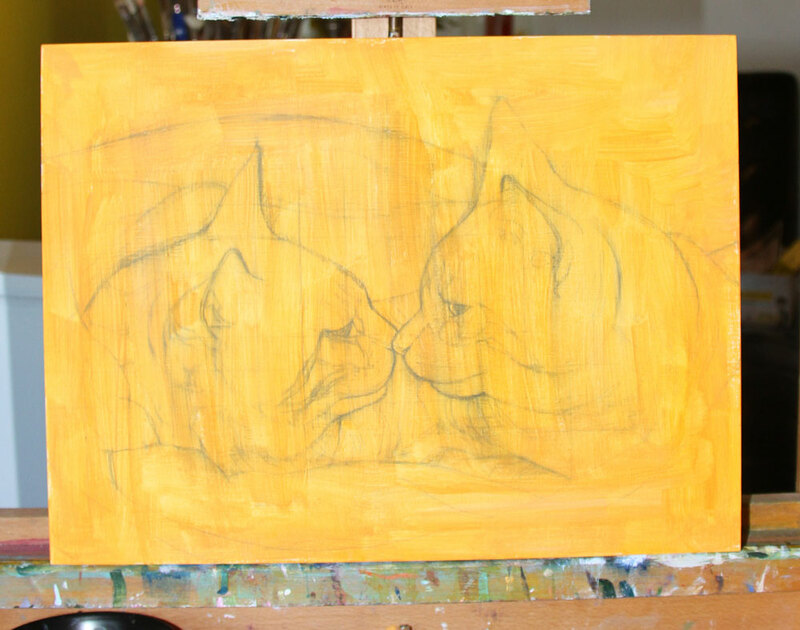 I will, once areas dry, add some reflected light, more specifically, orange to the areas that are closest to the fur. 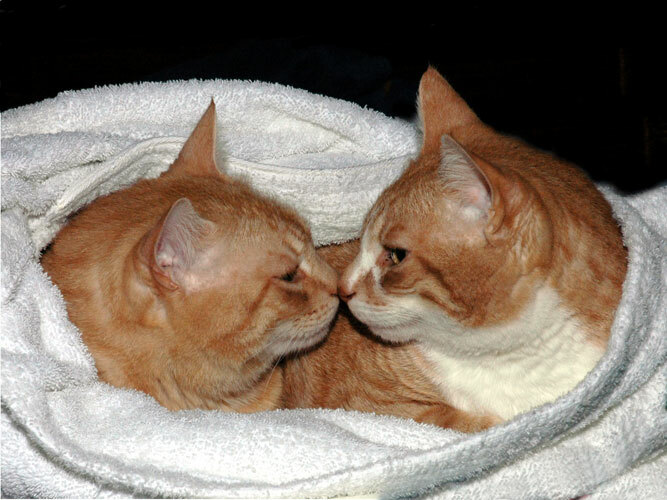 For example, the areas of towel that are just below their bodies has a slight orange glow to it. Same with the front fold. These areas of colour will be subtle and they will help add unity to the painting. I will also be adding shades of blue to the shadows. 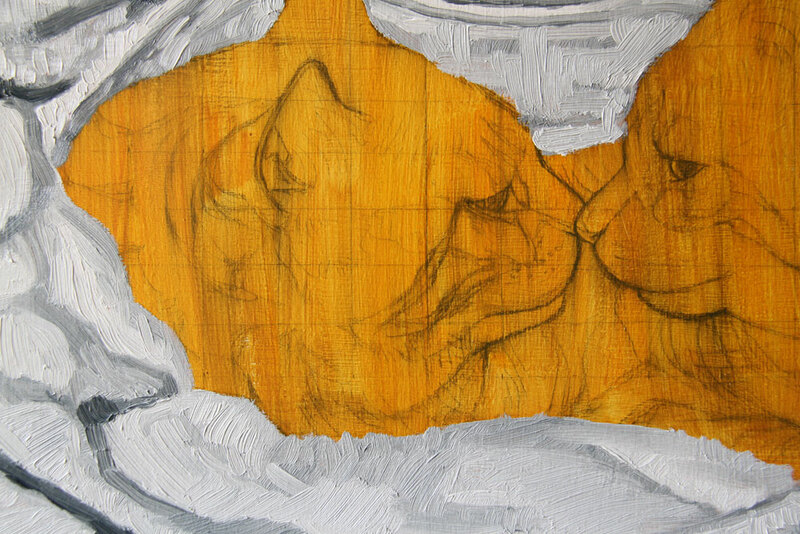 See below for a close up of the painting thus far…I’m really digging the brushstrokes! As for the Ginger boys, I will start painting them today! I know this step will take a few days since I will need to allow areas to dry before I can go in with the details, which is fine and all part of the process. This break gives me the time to sit back and study the over all painting, which in turn allows me to pick out “mistakes” and areas that need to be tweaked. That’s it for now. Perhaps tomorrow I will post my progress from today? If not tomorrow then definitely come back during the weekend.